This was either going to be my last project of 2011 or my first of 2012. This one continues themes that I first explored with "The Gardener" in 2000 and 2002 and "Atrium" in 2004. Love the imagination that goes into this. As a games developer in virtual world creation, your work here is excellent. Not too many repeaters in the vegetation, and very well placed. However, I'd like to see some the pea shooters from Plants vs Zombies in the flower beds! I've always used the "Planet" object to add starfields and other sky phenomena to the scene. Never have figured out the "environment map" method. Thanks for the suggestions. As it happens I have discovered some means of making starfields, but my biggest struggle was adding them to the back of vue scenes without loss of quality, which happens if you use an environmental map. I recently found a better method though. you're not actually assuming that Ryan is giving his vue secrets away intentionally, therby creating competitors, do you ? 1. This is a pretty good tutorial with which you can create realisic looking starfields. You need the free program "GIMP" for it. I have wondered how you make the stars in wallpapers like this. I have some experience with vue but dont know how to make star maps so detailed. My eyes were quick to dismiss this one upon first glance. But the more I looked, the more my eyes saw. Incredible detail, great lighting. Most unique about this one (to me) is that it captures my imagination much more so than your other works. The story behind this picture intrigues me... Beautiful. The change was so minor that I just overwrote the first version. Where is the pickle jar for this one...? @Chris J: OK, so it wasn't just me! Gotta have some good herbs to be in space. Thank you, Ryan, for removing the blue atmosphere lines around the planets. It looks so much better that way. However, the 2560x1600 resolution (but not the lossless version)still has the blue atmosphere line around it. The 1280 x 800 file should show correctly now. The 1280x800 is still the old render with the halo. Is there any change you might render the planet on its own? It looks stunning. The 640 x 480 file should be displaying properly now. Let me know if you are still having trouble! Link is there for it but it's bad. Just tried to nab it for my Android. ""break" in the planet curve"
Nice work! I really like this one, it reminds me of another one of my favorites, the overseer. Combining the colors of the vegetation, and the void of space is a nice contrast. Great beginning to 2012. I'd love to see an angled shot so we can appreciate the window more. I love this one. The brightness really pops out and captures your eyes. Nice job! The Overseer has always been a favorite of mine, and I'm in love with this render! I can't wait for the multi-screen renders! I love it Ryan, it is my favorite after the "highland" series. Yet another one of your renders that makes me sad that I will never see the locations you have created with my own eyes. Another beautiful work of art. Looks like you upgraded just in time (give or take a few months.) Are you looking to repair & upgrade Hydra or build a new alternate computer to render on? Obviously not as beastly as Bucephalus but one to crank away at multi screens and pickle jars? Nevermind my prior comment, I read further down into the comments and found your response. thanks. "1680 X 1050 issue perhaps?" Not sure if this is an issue but the planet outline breaks up on either side of the circle portion of glass. Its as if the circle area is a magnifyer making the planet look closer there but farther away on either side. Not sure if it is intended to be that way as an optical illusion but it just throws me off when looking at it. Other than that, its great. The shadows and colors of the terrarium are amazing. Looks very photo realistic. To be honest, I'd be grateful if you'd render another one without halo as a pickle jar version, (if you can manage to spare the time) since this is an otherwise lovely render ! Sorry to hear about your Hydra. I suggest to move to high efficiency passive (as in servers) or high quality liquid cooling (as in CAD-workstations) ... Or was it an high voltage electric spike ? Even the most famous science fiction authors stick to reality when it comes to basic planetary facts to avoid being labeled naive or clueless. BTW : Did you ever thought about the many childrem who are probably visiting Ryan's site 'cause they like the pictures ? When they start having basic astronomy in school, they will be forced to find out that they -didn't- receive a little of a head start by the images they saw on Ryan's page ... No, they have to start from scratch. They'll believe that they got it all wrong or doubting their own knowledge, probably thinking :"So, what else is is wrong about the things I believed to be true ?" ...sends me into a reverie. As for the atmosphere...I realize that this is all fictional 3D and that basic principles of physics don't apply to truly awesome art! Reminds me of the movie Silent Running. I like. Yes, the atmosphere is out-of-place for this type of planet. I actually used an older render (that went unused in an earlier project) for the background here. 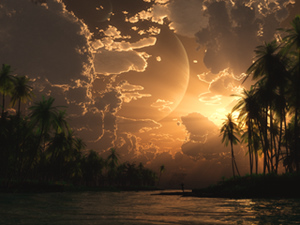 That scene was originally meant to be seen from far away (and through an atmosphere). The outer glow would only be a few visible pixels. It looks much larger here however and should be changed. It would be simple to re-render the original scene without the atmosphere, but unfortunately that scene file resides on my Hydra workstation which nearly went up in flames last week. The remains are at the Computer Deli waiting for me to come salvage what I can. The HDs are fine however and I should be able to either replicate this scene without the glow or create something totally new. I suggest to get rid of the atmospheric halo, giving the gas giant a jupiter-ish look. Gas giants do not have atmospheres - and even if they did, the oxygen layer would certainly -not- be on top of all layers, because Oxygen is heavier than hydrogen and helium, of which all gas giants are mostly composed of. If Oxygen would be present in gas giants it would certainly sink down, reacting with the Hydrogen to water in gigantic explosions, cause the interior of gas giants are very hot. Nice start for the new year! The fact that it continues a theme that you've been working on since 2000 almost gives it a sense of continuity, like the little dude in the cape has been keeping busy all these years and we now see his garden's progress. That idea that you mentioned about a story in conjunction with wallpapers sounds quite interesting. Awesome piece of work! Love it! This is much more up my alley than your last couple of pictures. I agree with Chris...definite echos of Silent Running. ...My garden is nothing like that, but I wish it was! As a student optometrist, I appreciate the break as good optics. Well done. My favorite images are almost always the "epic" images like this, that as others mentioned you can imagine a story wrapped around. My gripes are the blue monochromatic halo around the planet, and the person's head (it's either made of wood or he's microcephalic). Can't wait for the multimonitor render! When I first opened up your new wallpaper tonight, I could only sit here blown away with my mouth hanging open. I think an "Omg" sneaked out. This picture is incredible! I agree with Dylan - love the grand, epic feel to this. Love your dialog with rdeforest below, and the storytelling. :) Thank you for a wonderful new escape, and Happy New Year to you. 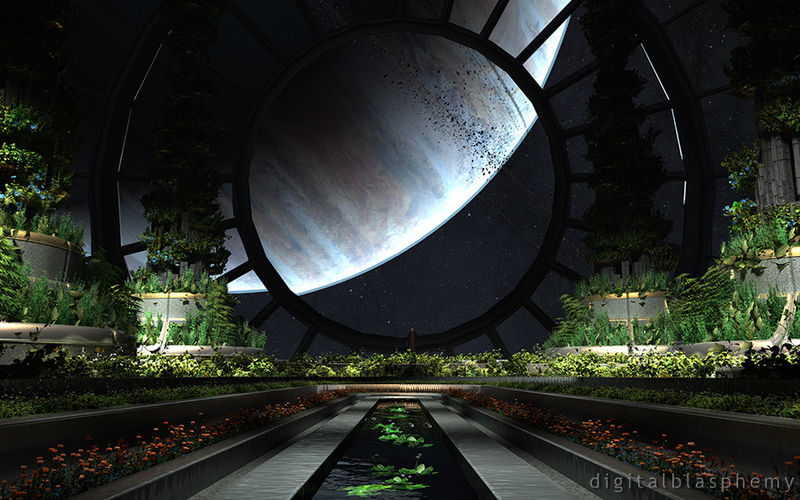 Love this piece the way it is, though you might want to go for a "Class M" planet where he might be collecting new plants, or go past a star where he can get some Vitamin D & the plants can get their photosynthesis on and we get a nice bright view of the garden. That being said I love it as it is! Love it, did you recently watch silent running? I agree with rdeforest's comment...this image in particular feels like a scene in a grand story. There's definitely a dramatic quality to a lot of your work, and I think you should definitely pick up your creative writing again at some point. It's a great outlet, and as a musician and a writer myself, I know that having more than one creative outlet allows me to use one to influence the other and explore different things, and using them in conjunction with one another like you've mentioned sounds like a fun and possibly very fruitful project. This is a wonderful perspective and very grand in scope. I would LOVE to see a Pickle Jar variation without the frames on the window, however - they lend to the feeling of this image being boxed in and less expansive than it could be. If the window the gardener was looking through was completely transparent, this wallpaper would feel much more wide open and epic, in my opinion...that's the one thing keeping this from being a 10 out of 10 for me. Top notch work here, Ryan. Much appreciated! I agree with the other poster that the discontinuity is kind of bothersome, I understand why it happens I'm just not sure you need it in the scene. Also the blue halo around the planet seems to look out of place, its not opaque (that I can see), have you tried removing it? Wow, this one is really nice. Every now and then you do a wallpaper that blows me away. Can't wait for the multiscreens. With the new age of the Kindle and self-publishing I am starting to wonder if it might be a good time to get back into writing. Perhaps a story in conjunction with a series of wallpapers. Maybe someday. I've said this before in the comments of other works of yours Ryan, but I love how you set up the tableaux in quasi-realistic scenes like this to create a sense of drama. In these images it feels like something is about to happen or has just happened that is very significant. Not just "fate of a planet" significant, but "this is the pivotal point in the story." Even your super-mellow summer beach scenes have a sense of adventure to them. In this one I'm reminded of The Culture books by Ian M. Banks. The story in my mind is that this gardener is a "retired" Special Circumstances agent who uses the tending of his garden as meditation but when he's not tending his garden he's deeply embroiled in political machinations all across the galaxy he currently calls home. He has very strong feelings about interfering with other civilizations and explains them to his guests in terms of the dynamics of the garden he cares for: "These plants could not survive in space without our help. Our interference broadens and enhances their influence in the universe. Species who would never otherwise interact with them, behold their beauty and fragrance and are touched by them. Perhaps it's not "natural", but is it really bad?" Then his guest points out that a comparison between plants and animated creatures organized into societies is probably insulting at best. The gardener replies, "I take your point. I meant no disrespect to these plants. I shall construct my analogies more cautiously in future." The "discontinuity" is caused by the center pane being further out than the panes surrounding it. They are at a different angle so the light is bent. This one I just like. It appeals to me at a very fundamental level. I can't wait to for the wide screen versions. There seems to be a continuity error. If you trace the outline of the planet as it passes behind the black muntins, there seems to be a pretty noticeable break in the planets outline. Regardless, it's an awesome picture. I like this one a lot. If only I could have a garden like that I would probably become a gardener. Very nice, keep'em coming Ryan. This is going to dominate my computer for awhile. I imagine if we could walk through your mind that this would be one of the stops. Not sure exactly how to classify this wallpaper seasonally (right now, I have it set to show up during the Spring/Night)... definitely worthy of being on the desktop. Reminds me of Tomb Raider for some reason, but space-themed. Eager for the multi-screens. "I do like it, BTW..."
The "slightly mystical, slightly science fiction" are my favorite wallpapers, Ryan. Thank you for this one. "Where did my resolution go...?" I've had several of your winter landscapes up on my desktop with ChronoWall, but this new one is definitely worth putting up. It kinda makes me think of a greenhouse on a distant planet looking out over a moon. :) Very very nice. Absolutely love this one. It will be the first Planets Nu (http://planets.nu) game background of the year! So glad I have my full DB membership! The movie referred to by hurtz is Silent Running. I thought of that too when I saw this. Id love to see view of this place from the outside. Happy New Year Ryan! Keep these awesome images coming! Nice touch with the "zoom" difference between the main window and the others. I would say the original inspiration probably came from "The Black Hole". Reminds me of the 72 sci-fi movie with Bruce Dern, and the little robots, tending the gardens.